Today I visited IARI, met Dr Pramod, Dr Saxena and Mr Sharma from IARI. They are setting up an incubator at IARI, Pusa premises. It is really nice that Govt organisation are now realising that wealth and business and development can be created only by entrepreneurs who take risk and also that entrepreneurs need to be supported. IARI is now looking for few entrepreneurs who can set up their office within IARI premises, get all support like admin staff, fax, furniture, electricity, power back up, parking place, a good library, access to students and qualified and competent faculty and a good networking opportunities and then a nice place next to a metro station. I also visited the exhibition at IARI premises. There were so many foreign companies who were selling expenses instruments for farms and field. Electronics is widely used in all developed countries to boost their agriculture output. 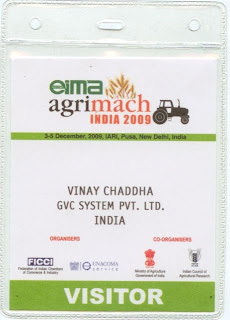 Now we are also looking to be a part of growing field of agri-electronics. Will be meeting IARI people again on 15th December.